Should You Wean Your Baby who Has Multiple Food Allergies? Ever since my first child was born, I have been a big advocate of breastfeeding. I figured I would nurse as long as there was an interest. This was heavily influenced by a friend who was still nursing her two-year-old. I weaned my daughter at 19 months because my second pregnancy had made it too painful–and she was only nursing once a day by then anyhow. I planned on nursing my son at least that long. But I began to have second thoughts about nursing as I watched him break our in a rash as he drank. It got worse as he got older. We tried giving him goat’s milk formula, and even experimented with homemade sunflower seed milk (that experiment landed us in the emergency room, though we didn’t make the connection between the reaction and the seeds until later, especially since he threw up just outside the hospital and had no symptoms once we got in the door). Soy wasn’t an option–we knew e was allergic to it. I didn’t know about hemp back then. It is a complete protein and has lots of good fat in it, but hemp milk is very expensive. I pay $34 per dozen for it from Azure Standard now, but imagine how much milk a 6-month-old can drink… I would use a case in a week or less. There are amino acid based formulas available, such as Neonate, but by the time we found out about them, he simply would not eat them. Period. And I don’t blame him; they taste awful. Plus I think there was at least one ingredient in them he couldn’t have; I don’t remember now. Once we were convinced that there was a relationship between what I ate and his eczema, I tried eliminating various foods from my diet to clear it up. This works in some cases. My brother was allergic to wheat as a baby and would break out in a rash anytime mother ate wheat. Once she made the connection, she quit eating it and he quit breaking out. But then, she quit nursing and switched to goat’s milk at 6 weeks due to supply issues, though his allergy to wheat, as well as some other things, continued for years. He was never as bad off as my son, however, and has pretty much outgrown all the allergies. So I tried eliminating the four worst offenders, wheat, soy, eggs, and milk, one at a time. When I saw no change after two weeks each, I added them back in. Later after some strange skin electroacu-something allergy test, I tried eliminating the 6 or 7 foods it showed as reactive. No change. Later he had an IgG food sensitivity test done, and I eliminated and rotated as best as I could based on the results. Still no change (thanks in part to several false negatives on that test–one of which was the infamous sunflower seeds; which reminds me, if you can eat them and can’t have dairy, they make a delicious sour cream–I found this recipe during this time). I remember hunting the kitchen in desperation one day, trying to find something to cure my nursing-induced hunger. But I couldn’t find anything that didn’t require preparation, so I ran to the local health food store to buy rice crackers and such. It was a very hard time. I had to bring my own food to potlucks. I remember mixing quinoa, fresh and frozen veggies, and olive oil, because I didn’t know what else to fix, and eating that while I looked with envy at all the delicious entrees and mouthwatering desserts everyone around me was eating. So I began to consider weaning. 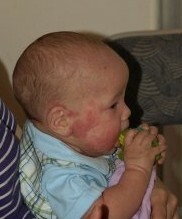 Manny had not been interested in solid food at 6 months. My husband thought I was neglecting him, but my research told me that as long as he was still gaining weight and nursing well, I shouldn’t worry about it. He finally did start eating around 10 months. I decided to wean him at 12 months. My plan was to feed him beans and cereal to give him a complete protein, with flax or olive oil mixed in for fat, and whatever veggie or fruit I could get down him. So at 12 months I began to wean him, finishing the process in less than two weeks. When I declared my intention to wean online, I could not believe the amount of flack I got for my decision. “Breastmilk is best for your baby, even if he has allergies,” some insisted. Others told me of how they had persevered with their baby’s special diet until they were two or even later, as if they were trying to make me feel guilty for wanting to wean so I could go back to eating normal, tasty food. I mean, try eating pinto beans without onion or tomato. My husband would not eat half of what I was forced to eat during that time. I didn’t know enough about gluten-free baking to give up gluten. If I had known what I know now, I might have tried, but it wouldn’t have helped, because there were other foods that he was highly allergic to that I was still eating. All I knew was that it was hard to identify trigger foods with the delay between my eating them and them turning into breastmilk and entering my baby’s digestive system. I knew it would be easier to do an elimination diet with him than with me, and that reactions would show up faster. So I ignored the naysayers and just weaned him. In hindsight, I know now it was the best thing I ever did. I was still eating so many things that we didn’t know he was allergic to (remember the sunflower seed sour cream? That was one of the things; we didn’t figure out that one until later). Plus I comforted myself with the thought that I had nursed him a good 12 months; many babies are lucky to get 6 months or even less. He was able to go straight to solids with rice milk and hemp milk for liquids, without the need to add in a formula. We did eventually find a good hypoallergenic multivitamin in capsule form that we could dump into his milk to help make up for gaps in nutrients (Children’s Basic Nutrients). It was much less stressful for me to cook him a batch of beans, blend, and freeze them to use a few cubes at a time (I froze them in ice cube trays), and cook cream of some gluten free grain, such as quinoa or rice or millet daily, than it was for me to try to find something I could eat that was palatable. We made more rapid progress in figuring out the trigger foods this way. And he thrived. How well is your baby eating solids? How long is the list if food allergies? 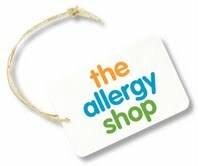 Have you identified all the food allergies? Can you survive on your baby’s special diet? How is your milk supply? Is the restricted diet affecting your milk supply? What is your budget for special formula, and is your baby young enough to accept said formula? Can your baby handle alternative milks, such as goat or almond, that could be doctored into a homemade formula? The longer you nurse, the better. Of course, whether you work or not, and how good your milk supply is, are factors to consider. And how well the baby is eating. Your baby should have breastmilk and/or formula until at least 12 months, though you can start adding in safe foods whenever he is ready. I would recommend waiting until at least 6 months, and then holding off on the grains for a few months more, since grains are harder to digest. If your child has just one or two or a few allergies, such as gluten and milk, then don’t eat those and nurse as long as you can. Websites such as Gluten-free Goddess have tons of delicious recipes, and I can testify that the Delicious Gluten-free Bread really is delicious! But if you are dealing with a long list, and getting enough calories to keep up milk production is becoming an issue, because the food is so boring it makes you lose your appetite, then perhaps you should consider weaning. If your baby can handle a homemade formula with a milk ternative, or you can afford the expensive amino-acid based formulas, or if you can get your insurance to help pay for them, and if you start early enough that your baby will accept them, then don’t feel guilty for switching to a bottle. Figure out what is right for you after careful research and prayer, if you believe in praying. And once you know what decision you are going to make, ignore the naysayers and guilt-trippers. Be a duck–let their criticism slide off without affecting you. Because you are the mother, and ultimately you know what is best for your baby. Period. Have you weaned a baby with food allergies? When did you and why? If you haven’t weaned yet, feel free to share your circumstances for feedback; I promise I will give opinions and not criticize your decisions, nor will I allow other commenters to do so. Please share!